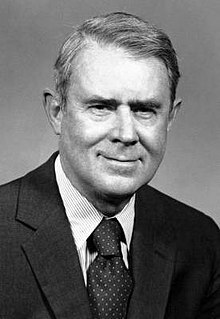 Mount Sinai Medical Center, New York City, New York, U.S.
Cyrus Roberts Vance (March 27, 1917 – January 12, 2002) was an American lawyer and diplomat. Vance was born on March 27, 1917 in Clarksburg, West Virginia. He was raised in Philadelphia, Pennsylvania. Vance studied at Kent School, Yale University, and at Yale Law School. Vance served as United States Secretary of State under President Jimmy Carter from 1977 to 1980. Prior to that position he was the Secretary of the Army and the Deputy Secretary of Defense. As Secretary of State, Vance approached foreign policy with an emphasis on negotiation over conflict and a special interest in arms reduction. In April 1980, Vance resigned in protest of Operation Eagle Claw, the secret mission to rescue American hostages in Iran. He was succeeded in the position by Edmund Muskie. Vance married Grace Elsie Sloane in 1947. They had four daughters and a son. Vance lived in New York City during his final years. He was diagnosed with Alzheimer's disease in 1995. Vance died at the Mount Sinai Medical Center in New York City on January 12, 2002 after a long battle with pneumonia. His death was a complication from Alzheimer's disease. He was buried at the Arlington National Cemetery in Arlington, Virginia. ↑ 1.0 1.1 "Cyrus R. Vance, a Confidant Of Presidents, Is Dead at 84". New York Times. 13 January 2002. Retrieved 13 October 2012. Cyrus R. Vance, who after two decades in public service was appointed secretary of state, and who then took the rare step of resigning from the nation's highest cabinet post on a matter of principle, died yesterday afternoon at Mount Sinai Medical Center in New York. He was 84. The cause was pneumonia and other complications, said Elva Murphy, his longtime secretary. ↑ Bell, William Gardner (1992). ""Cyrus Roberts Vance"". Secretaries of War and Secretaries of the Army: Portraits and Biographical Sketches. United States Army Center of Military History. Retrieved September 22, 2007. This page was last changed on 27 February 2019, at 18:01.